In the last two weeks I visited 9 cities and towns in 3 countries in Europe, from Tivat in Montenegro – a sweet town in the middle of nowhere, to cities like Gdansk located at Baltic seaside loved by foreign tourists to Manchester and London in the UK. As you can imagine, how I fuel my body was extremely important to me as was coaching, training, being coached, visiting my extended family and dealing with dozens of legal situations connected to consolidating my business. Going gluten-free changed my life as was not something I was ready or willing to pause. I HAD TO be at my best, physically and mentally. No way I could afford any gluten in my system. Nah-uh. Not every day I could cook for myself though. Having a lot on my plate, it was almost impossible for me to prepare all my meals. Plus, I really love experiencing local restaurants and cafés. But you know me – no compromise. Was it possible for me to order gluten-free everywhere I went? Well, it depended. Not on the country, not on the location, not even on the rating of the restaurant. It all depended on the good will and brainpower of the restaurant management, cooks and waiters. From getting a menu with gluten-free meals marked with a symbol, to getting a whole book on allergens and ingredients origins attached to the menu (brilliant!!!) to having a lovely waiter asking the chef about the gluten-free selection of the day I mostly had good experiences. A lot of places had nothing to offer to me, but ok, I get it. At least they were very upfront about it and didn’t make me suffer the next day. The most shocking experience for me was a chef in a hotel restaurant who asked me ‘what do you mean by gluten-free’. I turned around and left. 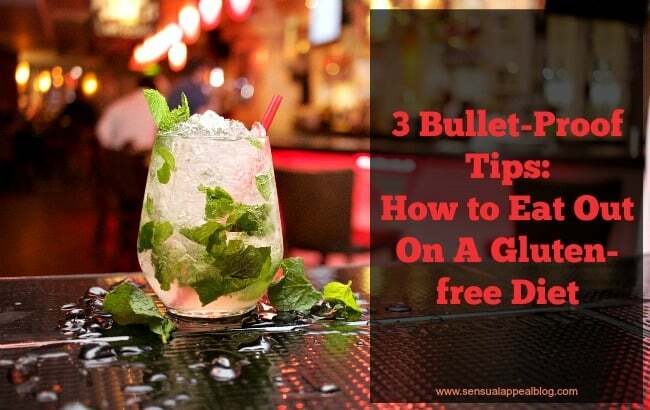 All this made me write this 3 Bullet-Proof Tips on How to Eat Out On A Gluten-free Diet. It may come in handy when you are about to eat out and the place doesn’t offer a gluten-free menu in a written form. Bear in mind all tips come from my personal experience so the results may vary. And if you have any other tips on how to eat out on a gluten-free diet, please email me so that we can share them with the world, too! Never in my life have I heard (I hope I am wrong) about any kind of food allergies training given to restaurant stuff like waiters and hostesses. Not in practice at least. 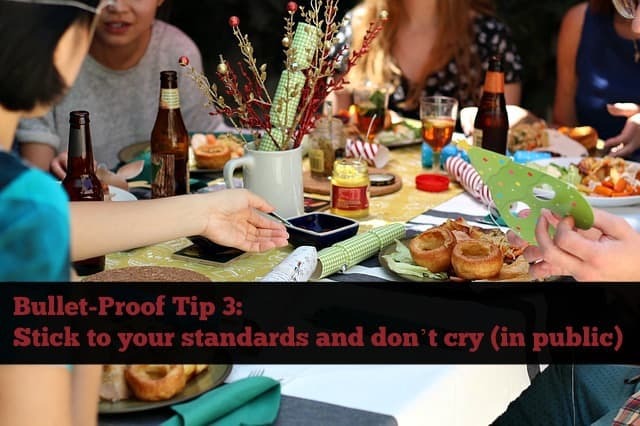 Naturally, and with no one to blame, regardless their best intentions, they may not be able to assist you to the level your gluten intolerance requires. 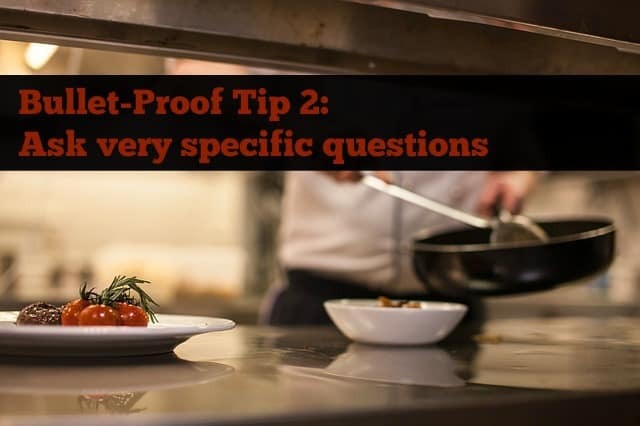 Use your own knowledge and guts to pre-determine what in the menu can be gluten-free. 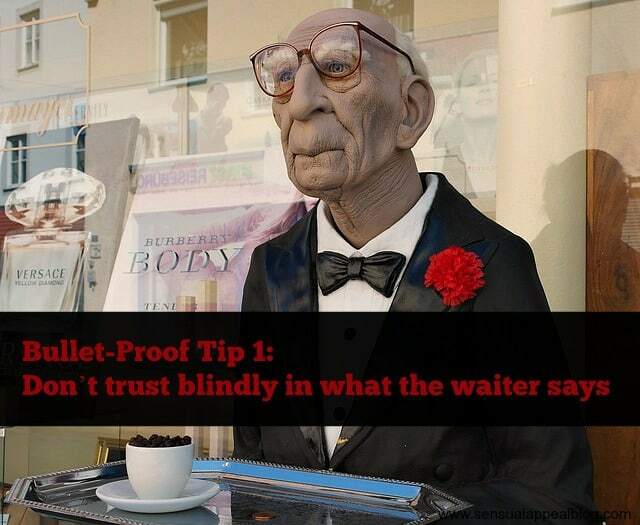 Once you pre-determine what meals could be suitable for you, talk to your waiter. Ask them very specific questions. If you are considering ordering meat balls (I wouldn’t) ask your waiter to clarify with the chef what type of flour they add to the meat to thicken and bound it. If you want to go for a double chicken potato waffle make sure the potato waffle is potato only. Always double check the soups, too, as they may contain bread to add extra texture. It can get even trickier. Grilled chicken with steamed vegetables may give you the false impression you are on the safe side of the menu. In practice, a lot of places cook their veggies above the boiling pasta and the steam from the pasta contains gluten that jumps onto your veggies. Just another thing to clarify before you order. This is when a dialogue comes in handy. Ask and you shall know. It may happen that the place you are dinning in offers nothing suitable for you. No matter how good the food looks, how great it smells and no matter how badly you want it and how hungry you are LEAVE. If you are alone, thank everyone for their help and leave now. Simple as that and as important as it can get. If you happen to dine with some friends and they do want to stay in the place, you may choose to leave or stay with them. If you stick around, stick to your standards. Don’t make one-off exceptions as it’s simply not worth it. You will regret it (and pay for it) for several long days before gluten finally leaves your system. Have your tea, coffee or wine (if gluten-free) and enjoy the company. You’ll eat later. Don’t cry (maybe a little bit in the restroom like I did in Krispy Kreme in UK when I found out they offer nothing gluten-free and I drove miles to check having my faith in them). It is ok to cry when you really love the food and you find out you can’t have it any more. It is ok to cry and it should make you proud, too, as long as you keep away from it. (At least, this is what I tell myself). Honestly, I am sitting in front of my keyboard thinking of how can I finish this post in a lovely happy manner but all I have in mind is the amazing heavenly smell of freshly made Krispy Kreme donuts in the café nearby the factory… the lines of donuts smiling at me, the crème, the chocolate, the caramel… The textures, the crispiness… Well, as much as I cried that night I was really happy that my friends are loving the experience. And that I stick to my diet and my rules (and that I can at least smell it!) One could call it a defeat. For me, it was a great victory. And great victories like this one I wish you with all my heart.